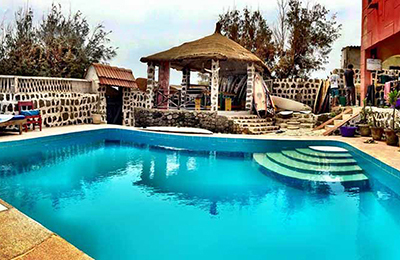 Laguna Surf Camp - Somone, Kayes Guests overall rating: ★★★★★ 5 based on 4 reviews. Traveling to the camp will make you feel as one of the iconic Endless Summer movie surfers on their wild Africa voyage. 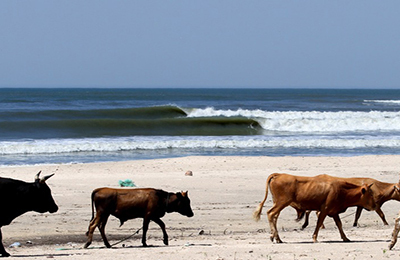 In fact, Senegal was the very first stop of Endless Summer surfers in Africa. The Camp is a great choice for those, who want to focus on surfing, ease into the famous relaxed African lifestyle and embrace the beauty of the nature reserve as it is a part of the nature reserve and bird sanctuary, where endless mangrove forests stretch for miles. You can choose between single and double rooms, equipped with private bathrooms, air conditioning and more. All weekly packages include copious breakfast and dinner. Delicious local specialties are served by the outdoor pool. Great place for learning how to surf, to stand up paddle (SUP), and to improve your level all year round. Initiation weekly program includes 5 surf/ stand up paddle lessons. Intensive program is also available and features 10 lessons. You can choose between single and double rooms. For a more authentic experience, the number of guests at the camp is limited to 16 per week. The copious breakfast and dinner are served in front of the pool. The chef will surprise you by his cooking talents, while proposing you some delicious local dishes. For lunch, you will have the choice between the beach shacks at the laguna, or the many restaurants in town. The camp staff will readily give you an advice according to your preferences. Somone is little known as a Surf and Stand Up Paddle spot, 70 kms from Dakar. We will not complain about it. In fact there are no huge waves here. This is the ideal place to learn how to surf on a gentle beach break, and a good trip for more advanced surfers who want to find a wild nature place with pollution free uncrowded waves! Perfect for longboarders. But be careful, sometimes the Laguna will surprise you with some barrels! Open to everyone, the surf school is a friendly place to meet people and exchange experiences, where everyone develops ocean knowledge and relationship with nature. With regular or intensive course, discover and learn at your own rhythm. You will be guided by experienced instructors, with who you will be able to learn with ease and confidence. The camp offers both, surfing and stand up paddle (SUP) packages. You can choose between Initiation (5 lessons per week) and Intensive (10 lessons per week) programs. The camp organizes “Stand up paddle” expeditions to the mangroves very often. You will be able to explore by yourself or in a group, the 11 km of mangroves and bolongs, while improving your paddling and discovering untouched and pristine wildlife. Even if you are not an avid bird watcher this relaxing and fascinating tour is still well worth doing. Incredible variety of birds, local women gathering shells and impressive, thick mangrove forests. Somone is a great place to ease into the famous relaxed African lifestyle and embrace the beauty of the nature reserve. Relax by the pool at the villa. Chill in a sunbed while reading a travel book or magazine. Wander around the Laguna, with beautiful clear water winding between sandbanks. Explore the village and meet local people. Try some delicious local dishes. Somone is the hidden gem of West Africa. 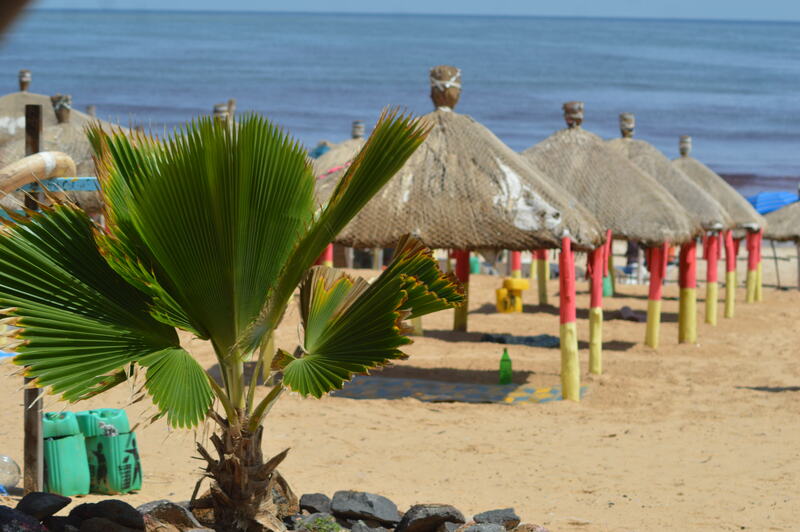 The peaceful village of Somone is located 1h30 from Dakar, the capital of Senegal. Somone Laguna is part of the nature reserve and bird sanctuary. The Laguna has fascinating bird life and mangrove ecosystem. The coast is formed of bays and rocky points. The water is generally calm, the main wind blows NW / NE, just parallel to the beach or slightly offshore. 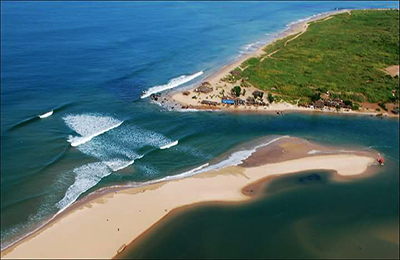 The river-mouth at the Laguna, forms a sand bank, ideal for all surfing sports. A nice wave breaks just in front. Very relaxing surroundings and authentic surfing experience. Treatment against Malaria is recommended. It is a good idea to bring insects repellent and loads of sunscreen lotion. For the surf trip, travel health insurance is obligatory. The camp is located 1,5h from Dakar International Airport (DKR). The national airline is Senegal Airline, which flies within the continent. Citizens of 125 countries, including EU countries, U.S, Australia do not need visa to visit Senegal. Maximum length of stay is 90 days. Make sure to check visa requirements for your country here: https://senegal.visahq.com/. "Stand up paddle battle race 2016 a la lagune de la Somone Senegal.que le rêve de l'été sans fin ne finisse jamais..."
A très bientôt. Loïc et Isaac"
"Merci philippe pour cette belle semaine de surf ! spot parfait et tres peu de monde à l'eau à refaire !!" "A partir de Samedi prochain je vais avoir les conseils du meilleur surfeur #phillipe meilleur surfeur"